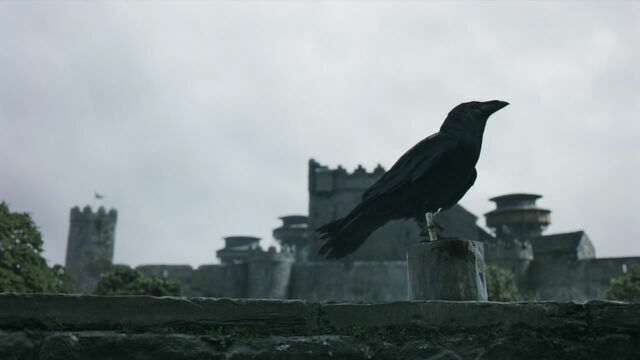 Game of Thrones images © HBO. As an adaptation, Game of Thrones has significant, often overlooked artistic merit that is distinct from the novels, including what may be allusions to works of art. Former Game of Thrones production designer Gemma Jackson mentioned in this video that they “search for images from all around the world”; presumably they are constantly looking at paintings, sculpture, friezes, and other art for ideas. As as result, I thought it might be fun to look at some places in Game of Thrones where art might have been the basis of a scene or image. The Titan of Braavos © HBO. Colossus of Rhodes by Marten van Heemskerck from the 1500s. The Colossus of Rhodes stood at the water entrance to the Greek island of Rhodes 280 BCE (BC) until an earthquake destroyed it in 226 BCE. The statue depicts the Greek god Helios, whom the people of Rhodes were honoring for their victory against invaders. Barclay’s nineteenth century depiction of the Colossus of Rhodes. At 30 meters (98 feet) tall, the bronze statue towered over other statues in the ancient world leading contemporary authors to dub it one of the Seven Wonders of the World. In the medieval period, people believed that the Colossus of Rhodes straddled both banks at the entrance to the harbor. Today, engineers believe the Colossus could not have stood with a leg on each banks without collapsing under its own weight.1 Consequently, in reality, the statue likely stood on one bank. The set designers didn’t necessarily draw on the idea of the idea of the Titan straddling the banks from art. In A Feast for Crows, the statue straddles two banks: “His legs bestrode the gap, one foot planted on each mountain, his shoulders looming tall above the jagged crests”2 . However, the Titan doesn’t appear to be on a mountain and the Game of Thrones scene even uses the a similar palette(blues with touches of pink) as the van Heemskerck illustration. Another example of an allusion to art is the publicity photo of Tyrion, who is posed in a manner reminiscent of Richard III. In this case, it is hard to tell if the allusion is to that particular portrait or to Richard III as a historical figure (which seems more likely). Ros and two different Caravaggio-like paintings of St. Sebastian that might have inspired the staging of her death. The one on the left is by Nicholas Regnier and on the right by Gerrit Van Honthorst c. 1623. Image of Ros: © HBO. After Joffrey sadistically shot Ros full of arrows for sport, her body is posed in a manner reminiscent of the Caravaggio-esque paintings of St. Sebastian by Gerrit Van Honthorst and Nicholas Regnier. St. Sebastian was a third century martyr who refused to renounce Christianity. Around 288 CE (AD), Emperor Diocletian sentenced Sebastian, a Roman centurion who was secretly a Christian, to death. His executors bound him to a stake, post, or tree and archers shot arrows at him. Does this parallel mean Ros was a martyr to Westeros’ other religion — power? You be the judge. The second part of this series discusses the similarities between some of Sandro Botticelli’s work and the Lion and the Rose episode (the Purple wedding). Very interesting. Classic art is always a good place to look for visual inspiration in TV shows. Although Game of Thrones did inspire another kind of art recently (yes, the Disney one).